I had the great honor of helping to present an American Legion Operation Comfort Warriors (OCW) grant to the St. Louis VA Health Care System - Jefferson Barracks Division. The $10,000 grant was presented before Thanksgiving, and it was a reminder that as we prepare for this giving holiday season, OCW takes care of our families all year long. OCW is fulfilling grant requests monthly to meet the needs of recovering wounded warriors and veterans receiving care at VA hospitals. The program provides various items all depending on the need. 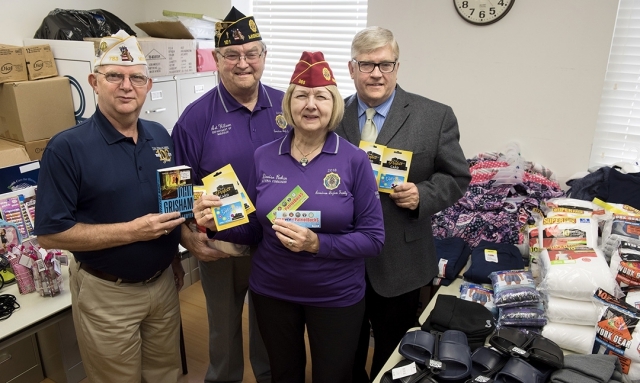 The St. Louis VA requested and received 30 health and comfort kits; two 60-inch flat screen televisions; three 32-inch televisions; winter clothing and apparel; and $5,000 in canteen booklets to help VA patients purchase food or other health care items during their stay. The OCW grant at the St. Louis VA also served as a reminder of the positive difference our Legionnaires make as VA volunteers. During my visit I learned of a story about Harrison Ochs, a World War II veteran, 51-year Legionnaire, and former service officer and volunteer at the VA. Because of a relationship that Ochs formed with a nearby Shoe Carnival, the OCW grant purchased 20 shoe gift cards for $40 apiece but have a value of $55 and up. The gift cards are used by veterans who graduate from the VA’s Domiciliary Residential Rehabilitation Treatment Program and need shoes for their new job. Since Ochs has moved out of state, Legion Service Officer Thom White has stepped up to make sure the program continues and that a service officer always takes the veteran shopping. Nearly 2,500 veterans have been a recipient of the shoe program since its inception in the 1990s. I want to thank you, the Legion Family, for making a difference in wounded warriors and veterans lives through OCW grants. We are always there ready to help out our veterans who need extra comfort.